"With this novel, Elliot S! Maggin exhibits his mastery of the super-hero genre, the nature of true heroism, and how to inspire people to greatness. By pure genius, he weaves DC's legendary mythos with countless other mythologies into a mind-blowingly powerful combination light-years beyond the sum of its parts." 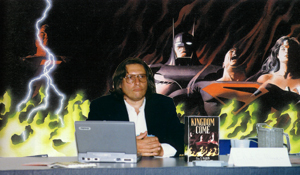 "The novel that Maggin is doing is brilliant; it had to be this enormously thick hard cover prose text book, and I'm reading chapter after chapter and he's using 30% of Kingdom Come and 70% new stuff, and it's just amazing the stuff he's coming up with. 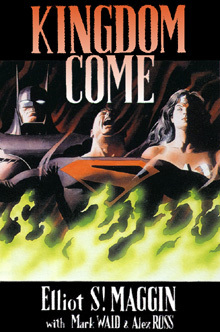 So anyone that likes Kingdom Come, this is required reading." I had lost my faith in an interesting way. I believed in the existence of everything: Heaven, Hell, the Angelic Host, demons and possession, redemption and growth, the value in spiritual terms of the suffering of the innocent, our place in the Universe and the Universe's place in Creation. I believed in God and all His glory. I believed in Immaculate Conception and Original Sin. I believed in something I called Original Sainthood. I believed in Santa Claus and that men had walked on the Moon. I believed that an educated man who does not believe in miracles is not a realist. I bought it all. Always had. Still do. I just did not feel a part of it anymore. My loss of faith had to do with the continual reminder, on a moment-to-moment basis, to myself and everyone I had ever loved, that we were insignificant, and that the imminent possibility of the loss of our lives and even our immortal souls probably did not matter a damn, either to God or to His emissaries on Earth. It was a world without a Superman. Kingdom Come graphic novel introduction! Interview by Superman Through the Ages! This book should be available at your local bookstore. Many stores put in a very small initial order and may be sold out, so if you are trying to track down a copy you may want to check with their customer service department. It is also currently available at our on-line bookshop for only $5.85 and will be shipped within 24 hours.